Just a few seconds of your time now will ensure hours of carefree fun and exploring later. And you can enjoy your journeys safe in the knowledge that should anything happen you can get the help you need. To help us continually ensure our ebikes surpass your expectations, please answer as many questions as possible. Thank you. Five years on the e-bike’s frame. 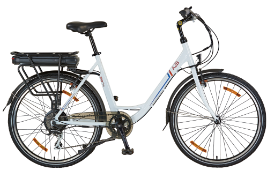 Two years on components and battery – covering all parts of your e-bike except brake pads, chain, freewheel and tyres. Normal wear and tear is not covered in warranty and neither is accident damage. The warranty terms mentioned above are applicable for European markets only and are different for other markets. Please see your local dealer for more information. Which dealer (bike shop) did you buy from?